Chocolate that’s actually good for you? Shut the front door! Fed up of being nagged by my kids ALL. DAY. LONG for chocolate, I wanted to make something that I didn’t feel tooooo bad giving them (and me!) as a treat. These chocolate superfood bites were inspired by Christine Bailey and have many health promoting ingredients like raw cacao powder (full of magnesium), Acai powder and goji berries (packed with antioxidants) and lucuma powder (a super nutritious Peruvian fruit high in vitamins and minerals) as well as being refined sugar free and with two pieces providing 15% of your daily Vitamin A requirements, and 2.5g protein, with only 104 calories. 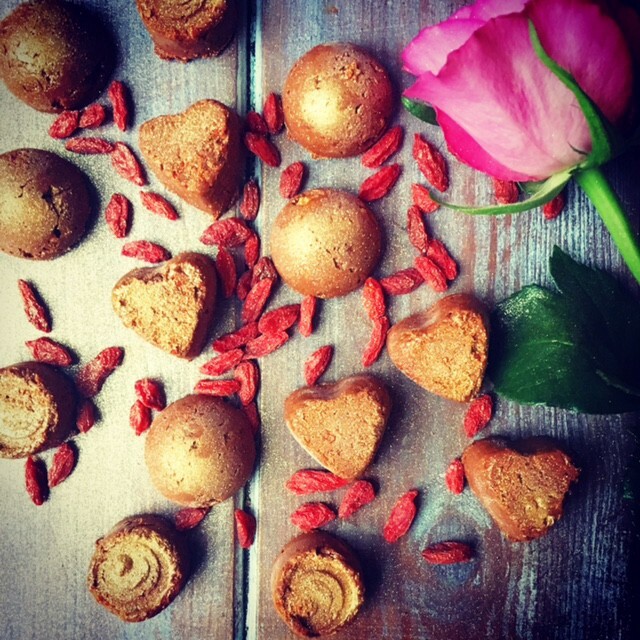 · Soak the goji berries in warm water for 20 minutes. · Melt the cacao butter over a low heat. · Crush the hazelnuts to desired size — I like mine quite chunky. · Add the Xylitol to a high speed blender and blitz until a fine powder. · Scrap down the sides of the bowl and add all of the remaining ingredients apart from the hazelnuts. Blitz again. · Transfer to a bowl and mix in the hazelnuts so that they don’t get broken down too small in the blender. · Roll into bite sized truffles (or put into moulds) and place in the freezer to set for at least an hour. · They can either be eaten directly from the freezer (my personal preference) or kept in the fridge there to be enjoyed slightly softer (my daughter’s preference). Either way, they are just delicious!